Over the centuries and across the globe, Muslim authors and artists have given moving testimony to their experience of being members of the Islamic community. Their many vantage points come together in this collection, one that represents major Islamic groups from the past through the present and covers a range of themes essential to understanding Islamic spirituality and religious life. More than thirty leading Islam scholars present translations originating from a dozen languages, including Arabic, Persian, Chinese, and Indonesian. Texts include samples of virtually every major literary form of significance to the Muslim faith: the Qur'an, hadith, scriptural commentary, letters, treatises, lyric and didactic poetry, hagiography, historical chronicle, aphorism, endowment deeds, and personal diary entries. In addition, over five dozen illustrations thematically document a full range of artistic forms and historical periods, from ritual objects and architecture to manuscripts of religious texts. 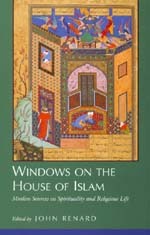 This volume and its companion, John Renard's 1996 book, Seven Doors to Islam, are the only books available that integrate such a wide range of Islamic literary and visual forms. Together they offer a superb introduction to the primary religious sources as well as a general understanding of Islamic spirituality and culture. John Renard is Professor of Theological Studies at Saint Louis University. His previous books include All the King's Falcons: Rumi on Prophets and Revelation (1994) and Seven Doors to Islam: Spirituality and the Religious Life of Muslims (California, 1996).